Following the films world premiere as a special presentation at this year’s Toronto International Film Festival, Bankside Films has struck a deal with Blue Fox Entertainment for the North American rights to Treasure Entertainment’s black comedy ‘Papi Chulo’. 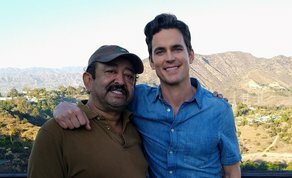 The film stars Matt Bomer (‘The Normal Heart’) & Alejandro Patiño (‘The Runaways’) and tells the story of a lonely TV weatherman who strikes up an unusual friendship with a middle-aged Latino migrant worker. Other cast members include Wendi McLendon-Covey, Elena Campbell-Martinez and D’Arcy Carden. Bankside is handling the world sales rights for the film and is currently showing it to buyers at AFM. ScreenDaily reports that Blue Fox Entertainment will aim for a late-Spring theatrical release in North America. ‘Papi Chulo’ is produced by Rebecca O’Flanagan and Robert Walpole of Treasure Entertainment, and is supported by RTÉ, Head Gear Films and Screen Ireland. Phil Hunt and Compton Ross will executive produce for Head Gear Films, with Hilary Davis, and Stephen Kelliher for Bankside Films. As well as being his third feature film, ‘Papi Chulo’ also marked Butler’s third time receiving a world premiere at TIFF following the critically acclaimed ‘The Stag’ (2013) and ‘Handsome Devil’ (2016), which was later picked up by Netflix. Other projects on Bankside’s AFM slate include Peter Strickland’s ‘In Fabric’, Lisa Barros D’Sa & Glenn Leyburn’s ‘Normal People’, and Adam Randall’s ‘I See You’.